Check out best tips to pass CDS exam with proper preparation plan and best books here. Passing CDS exam consists of English, general Knowledge and Mathematics question papers. Find out best books for CDS English, Mathematics and general Knowledge. Check out best tips to pass CDS exam with proper preparation plan and best books here. Passing CDS exam consists of English, general Knowledge and Mathematics question papers. Find out best books for CDS English, Mathematics, general Knowledge and tips to pass the CDS exam. Generally candidates who have applied for CDS examination have less than a month left for the CDS exam. Syllabus of CDS exam can be divided broadly in three subjects. Before checking out about our preparation plan, let us see which are the best books of English, general knowledge and elementary mathematics of Combined Defence Services Examination. 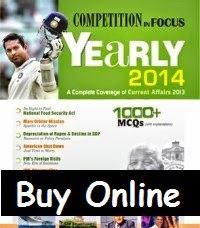 Arihant Competition in Focus book is the best book for preparing CDS current affairs. Out of 120 questions 20 questions of current affairs will be asked in CDS exam. So reading Competition in Focus book is a good deal in short span. Also this book will be beneficial if you are giving any other entrance exam. The book covers events of 2013 year and actually gives extensive coverage and is far better than the monthly magazines like Pratiyogita Darpan and CSR. But I would again like to stress on the fact only 1/6th part at most can be current affairs, rest all is static knowledge so focus more on it. 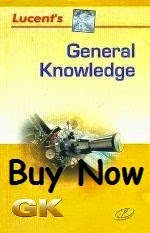 For CDS exam general studies, Lucent General Knowledge book is the best book to study. Lucent book is just a summary of all NCERT books and General Science manual. But is enough to study Lucent General Knowledge book for clearing GS part of CDS exam. A huge amount of questions have come from this book. This book is a good deal if you don't have much time for preparing for any exam, a short cut I must say. 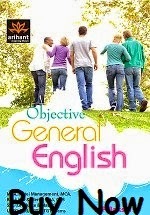 Best book for English preparation of CDS examination is Arihant Objective General English. This english book has quite extensive coverage of all the aspects of English. Arihant General Objective English book has a lot of exercises for spotting the errors which most of the candidates don't do it correctly. So this book will definitely help you in your upcoming exams. Previous year question papers of CDS exam will help you a lot especially when they are with solutions. So we strongly recommend buying a CDS solved question papers book. 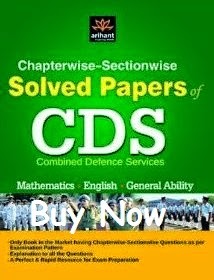 Arihant's Chapterwise Solved question papers of CDS exam book is the best to buy. But if you are tight on money like me, so visit http://www.upsc.gov.in/questionpaper/2013.htm#PageTop here you can find previous year question papers of CDS ( please search the name as other exams previous year papers are also there) right from 2009-2013. You may refer to the Arihant Pathfinder for this but only to see the topics, because it is only superficially explained . 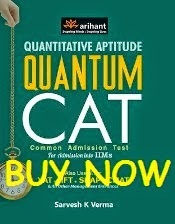 This book which I am suggesting now is "Quantum CAT" by Sarvesh Verma it may not cover every topic but definitely is good to buy, it actually helped me a lot. Please do the Level-1 questions that is sufficient to clear the maths part of the CDS exam. After checking out best books for CDS exam preparation, let us see how to prepare for CDS exam. Remember that without preparation, you will not pass any exam. Friends, first of all vocabulary cannot be developed in a day, it takes a lot of time so please don't waste your time in memorizing the words from xyz book. Practice more on spotting the errors part, do a lot of comprehension part try to read it as fast as possible. It will save a lot of time. The CDS English paper mostly deals with rearranging sentences, sometimes Fill in the Blanks also. The sad part of the exam is antonyms and synonyms, specially if you are from Hindi Medium, because in this either you know it or you don't know it. Last time antonyms and synonyms consisted of 1/3rd of the English paper. Guys although grammatically you are zero in English, you can score most of the marks from English, I would suggest that do not leave any questions if you have any scanty idea of the same, go for it, If you are a regular reader of Editorials usually most of the words are not very new, what I use while answering the questions is I read it many times somehow I manage to get an idea or the sound or the context of the word or blank or error and then I relate it with the question and options, this theory is not foolproof but if it fetches you 70-75 marks in CDS. I believe it is worth going for it, specially for OTA candidates! For history, concentrate more on the cultural aspects of ancient and medieval, Indus, Jainism, Buddhism. Read about books written, monuments build during Mauryan and Gupta empire. For medieval study Delhi sultanate and Mughals (concentrate on the cultural part. Modern- it is the crucial one.) In CDS exam papers, lot of questions are asked from modern history. So do it well for all history. Classify the previous year questions in to ancient India, medieval India, modern India and world history. Then search for topics surrounding the questions asked. If the event asked in question paper had occurred in 1916 lets say, then in the same year what all related incidences have occurred, or around the same year what all happened with reasons. More specifically, in one of the papers, of First Round Table Conference was asked, then not only search for First Round Table Conference, but also for Second and Third Round Table Conference, along with the reasons of successes and failures. If French Revolution and its reasons are asked, search a bit for for American and Russian Revolution. For politics questions of CDS exam, UPSC is asking tough questions. So concentrate more on panchyati raj, urban govt, removal of judges, bills, governor, constitutional bodies, non constitutional bodies. As only one month left for CDS exam, just read Tarun Goyal GK or Lucent polity part. You can correct all the polity questions because they are very fundamental. For economics part of CDS exam preparation, topics such as RBI Monetary Policy, FDI, anti poverty and employment generation programs like JNNURM, PMGSY etc, and terms such as GNP, NNP, GDP are important. Als leading products of India like Pulses, Bananas etc., and Green, White and Blue Revolution, important industries of India, Banking System of India, Currency and Inflation(Important), working of international organizations like IMF, IDA, WTO etc, census(2011) of India is also very important. Type of Taxes, Depreciation, Type of taxes : Wealth tax, Income tax, Service tax etc are also to be covered up by you. For geography part of CDS exam, know the locations of important cities in our country, see our map at least 5 times before going for CDS written exam. Eg. They give dots and ask match the columns to locate. Tuticorin and Cochin are closer. Know exactly where the city is as questions related to maps are scoring. Know the details of the concepts like international date line, doldrums, types of monsoon winds with their flow, identification of winds questions will be asked. In last CDS exam papers, few questions were also asked from world geography, so also have a look on the world map. Science part of CDS exam is very small and is very scoring as 1/3rd of the paper will be from it. It is suggested to read all the topics you find in Lucent book. So go on and prepare well for CDS exam and pass easily.